Set your phasers to sing as today marks the birthday of William Shatner, the man who brought us one of pop culture’s most iconic science fiction characters. While most recognized for his portrayal of Captain James T. Kirk from Star Trek: The Original Series and its prevailing movies, what many might not know is that Mr. Shatner also played a few unforgettable roles on another classic sci-fi series, The Twilight Zone. One of his most memorable characters was Bob Wilson, the haunted passenger who was the only person to witness the Gremlin on the plane’s wing in the episode "Nightmare at 20,000 Feet". Mr. Shatner also played Nick Carter in the infamous episode “Nick of Time”, where a honeymooning couple stumbles upon a Mystic Seer machine that allows them to see into the future. 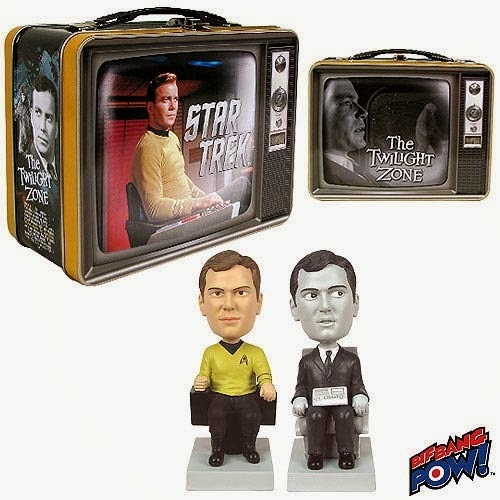 Celebrate the occasion by boldly going to Entertainment Earth to check out all of Bif Bang Pow!’s one-of-a-kind collectibles, including our Star Trek / The Twilight Zone The Captain and The Passenger Monitor Mates set, Star Trek II: The Wrath of Khan Kirk Bobble, and our entire line of The Twilight Zone “Nick of Time” themed products! You can explore all of our Star Trek and The Twilight Zone collectibles exclusively at Entertainment Earth! - Captain Kirk, Star Trek: The Original Series, "Dagger of the Mind"
- Captain Kirk, Star Trek: The Original Series, "A Taste of Armageddon"
“I've already got a female to worry about. Her name is the Enterprise. - Captain Kirk, Star Trek: The Original Series, "The Corbomite Maneuver"
Toast to the Best and KISS your Thirst Goodbye!